It would be nice to report that our last birding walk of 2011 turned up some extraordinary birds and I managed great field sketches of them all. Why leave it at that? I actually managed to do my first plein air paintings of them as well. But that's what would have been nice. We did see 20 species at Morris Arboretum but didn't find anything extraordinary. The most unusual bird was a Brown Creeper, a winter bird that's always fun to see. But he didn't sit still long enough for me to get any sketches. I did finish up the immature Red-tailed Hawk above though when we got home. It's 6x8 inches and done in acrylics. 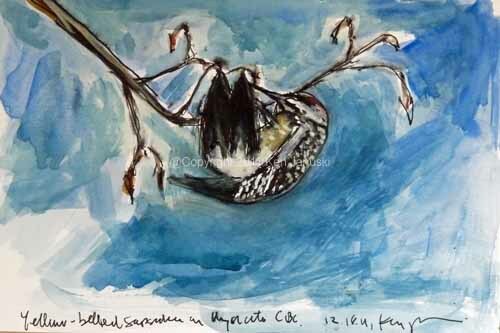 It's based on a bird that seemed to be at Morris the entire summer of 2010. 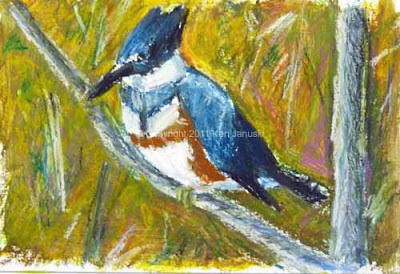 I've looked at photos I took of the bird many times and have always thought a beautiful painting was there for the taking, the whites and browns of the bird shimmering against the gray-blue sky. But for some reason I couldn't ever picture myself ever being successful doing it in watercolor. As I've continued to work in acrylic though(this being my fourth acrylic of the last few months, the first in over 25 years), I keep thinking that I can tackle previously forbidding projects in acrylic. My guess is that the reason for this is that acrylic, or oil, is just so much more forgiving than watercolor. Since I spent many years as an abstract acrylic and oil painter I'm not surprised that it's starting to become comfortable to me. That is not what got me started on this painting though. 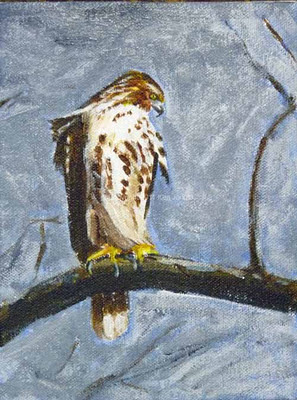 That can be attributed to the fact that I realized it was past time for our local accipiters, Sharp-shinned and Cooper's Hawks, to be visiting our feeders trying for our feeder birds. 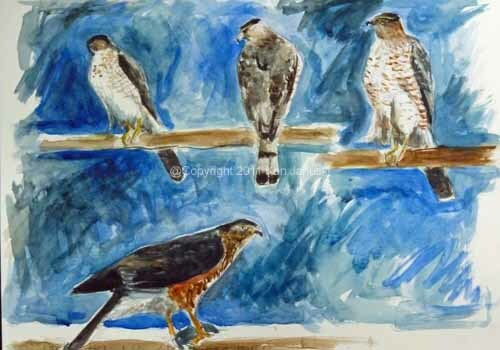 I decided to do some sketches of Coopers Hawks, above, from photos of previous backyard accipiters. My idea was to refamiliarize myself with them so that I could be prepared for possible field sketches. I'm always thrilled to sketch them but rarely satisified with the results. After I did these sketches from photos I added watercolor. Though these are not particularly successful they remind me of why I remain infatuated with watercolor: the sense of light. Oil and acrlyic can create great light effects as well but for true unadulterated celebration of light there's nothing that can beat watercolors, at least in the hands of someone who has managed to master them. After all my years of art it's not often that I find myself with a medium that I'm not used to and didn't really expect to use. But a chance remark at a gallery opening led to a Christmas present of some oil pastels. I can't remember how long ago it was I last used them but I know it was a VERY long time ago. Nonetheless I'm a bit rusty from the holidays and experimenting with the oil pastels seemed like a good way to ease back into picture making. There is something about oil pastels that is appealing, for instance their rich colors. But there's something also I don't like: the difficulty of making sharp lines. Once you start using the pastel the shard edges become blunt. Regular pastels have this problem too but I've always found a way around it. So I can still make sharp lines when I want to. i find it harder with oil pastels. Maybe that's why I haven't used them in such a long, long time. The drawing above is based on a photo of a Belted Kingfisher seen at Morris Arboretum this fall. I often sketch them from life at Morris. But there's always something more to learn, something that I need to learn because the bird flies before I'm able to get it all down. 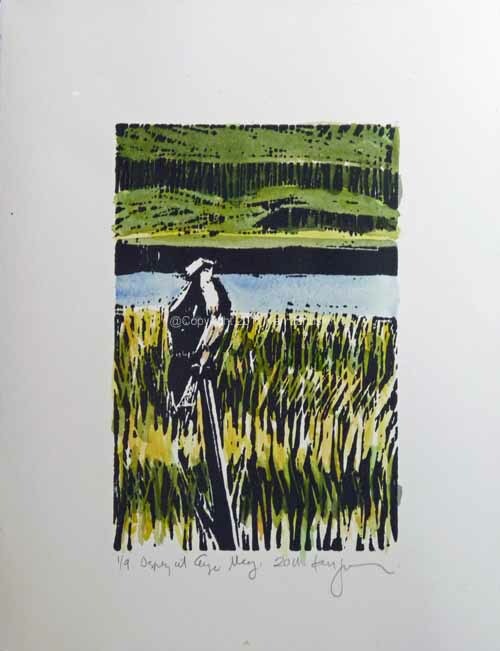 I think if I knew the bird better, for instance the size and shape of the bill or the relation of the flight feathers to the coverts, I might be able to sketch them in after the bird has flown. I often feel, particularly in winter when it's harder to be outside sketching, that it's worthwhile to sketch from photos and try to get down all of the details that I miss in my field sketches. So that was the start of this: a fairly detailed drawing that I then covered over with the oil pastel. It's very small, about 6x8 inches I think. I can't say I'm thrilled with it but it is acceptable. You can always learn something by working with new media. Sometimes that's the way you fall into the perfect medium for yourself. Since I resumed acrylic painting a few months ago I decided to buy some little pre-stretched and primed 6x8 inch canvases. I thought I might use them like sketches and they might force me to keep experimenting with acrylic. 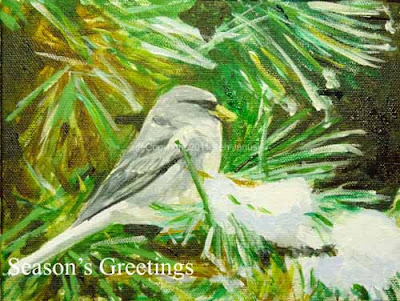 So a thread on the Wildlife Art section of Birdforum today focusing on paintings that illustrated the theme of Season's Greeting and Happy Holidays was just what I needed to try out those canvases. This is based on a photo of a Dark-eyed Junco that was in our Swiss Stone Pine after a rare October snowstorm. And we've seen no snow since! Yesterday we took part in a Christmas Bird Count, one of very many that began last week and will continue through January 5, 2012. As the link to the national Audubon site above says it is now over 100 years old and has tens of thousands of participants. I imagine there are various reasons for taking part. For us, as with the Philadelphia Mid-winter Bird Census, I always realize that much of it is that we just enjoy being outside in cold weather. I suppose if we didn't live in a large city we'd go skiing or snowboarding or something like that. It is more than that of course. It is about birding, the thrill of the hunt, as well as conservation. But in the end I always feel that I've just enjoyed being able to spend most of a winter day outside. Of course this would be far less thrilling without warm clothes! I didn't expect to sketch or take photos yesterday. I knew it would be too cold to spend much time sketching. And I didn't really expect any rarities. But toward the end of the day this female Yellow-bellied Sapsucker curled itself up like a grub on the slender branch shown above. I assume it was eating but what? I don't think there were any insects on these tiny stems. I really didn't look closely enough to see if there were any tiny berries there. My recollections is that there were either catkins or small leaf buds. After I posted this I mentioned it to my wife. She was paying more attention than I: the bird was eating very small berries. In any case it was an unusual pose for a sapsucker. It was made all the harder to draw because she was facing away from us. Her tail was in focus and her head was opposite the tail, horribly foreshortened. But it was a pose too interesting to pass up. So I pulled out my sketchpad from my backpack and did a quick sketch before she flew a second or two later. This is an ink, watercolor and gouache sketched based on that quick field sketch. 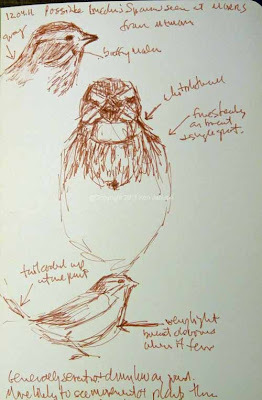 I missed so much information in the original sketch so reconstructing a correct view of the bird was difficult. So I looked at other sapsucker photos I have, at some downy woodpecker photos in a vaguely similar position that I have and guidebooks. This is pretty close to the original sketch. There are some details I question in it. Are they correct? Perhaps not. But I'll look more closely next time I see an upside down woodpecker. It does get a sense of the pose and commemorates a moment in a CBC. Just one more of the enjoyable aspects of a Christmas Bird Count. This one by the way was for Wyncote Audubon, our local Audubon chapter. Many claim to be on the cutting edge of just about everything. An email I received today promoting something as 'cutting edge' got me off on a cliche rant. Just how many years can something be on the cutting edge? When does the cutting edge become the blunted through overuse edge? If everything is on the cutting edge is it better to be elsewhere? So as a service to all readers I show you two of the true cutting edges of art. 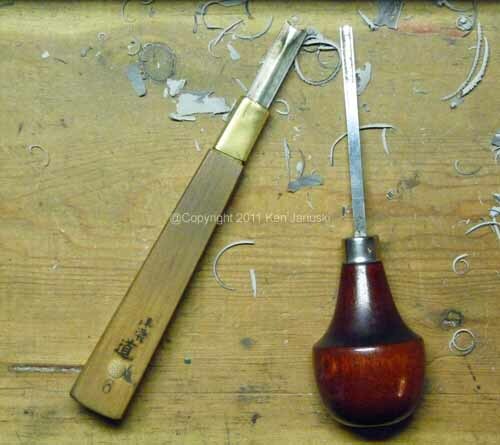 These are two of the carving tools I use when cutting linocuts. My dislike of this cliche is very old. I tend to forget about it until I see someone promoting something as cutting edge as I did today. It makes you wonder if people think when they speak. Do they have any idea what their words mean? What drives me nuts about this particular cliche is that it uses a hackneyed term to describe something that the user wants to embellish with a sense of newness. Instead it instantly shows that it is old and hackneyed. It's always dangerous to generalize. Nonetheless I'd say that the majority of artists I've known have a particular nose for truth and falsehood, for honesty versus hype. My guess is that most of them would not describe their work as cutting edge. They may quite honestly be trying to do something new, different, fresh, to breathe new life into old forms and structures, to find a fresher way of expressing something. But I doubt that they ever care about being on the cutting edge. Even if the term were not a cliche I don't think newness for the sake of newness if the goal of many artists, except for the ones maybe who don't pursue art for personal reasons but more for the cache that if offers in society, a cachet that is as often a bad cachet as it is a good one. Still I'm sure that the cutting edge will always be with us, especially in the arts, as artists push the envelope, over the edge, breaking new boundaries in the wonderful world of cliches. 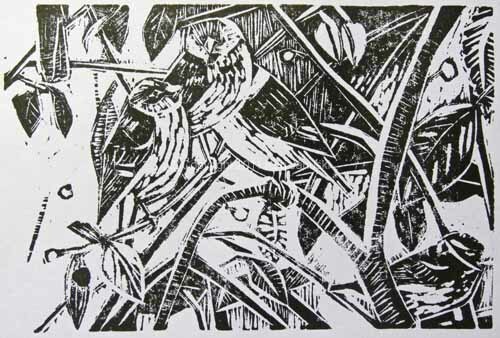 That said here is my newest linocut made with my cutting edge carving tools. This print was more successful on copier paper using a cheap ink. I mistakenly added a thinner to the ink when I switched to oil-based ink and printmaking paper. Most of the crisp edges are gone and over 20 prints on two types of paper never really got them back. So for now there is this one somewhat indistinct edition. In the coming days I'll try a different ink on good paper to see if I can get a sharper edition. This is based on the watercolor of House Sparrows in our Winterberry from the last post. 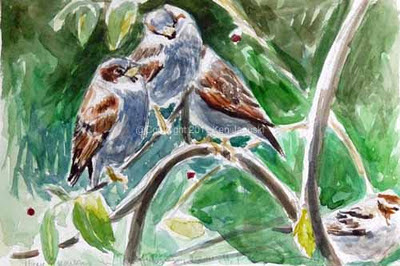 Until recently I've had a lot of the local House Sparrows visiting my window feeder,which sits just a few feet away from me as I write this. 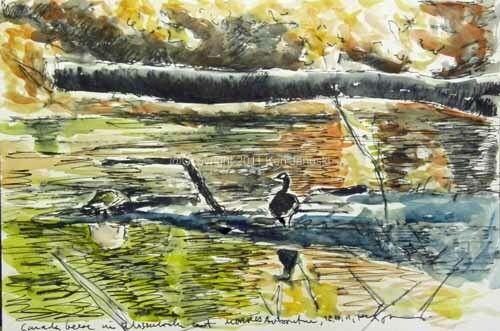 I've shown a few of the field sketches. Since they're only there for the food though no one is sitting still. They all land on top of each other fighting for a place at the table. In a split second they're gone. So I've been able to do some sketches of them that I think have a sense of dynamism. But they don't have much detail. I've haven't been able to get a good look at the bill, at the facial coloring, especially on the male, or at the feathers. So recently I took a few photos of them sitting on one of our winterberries on the backyard. There they are a bit more likely to sit but they're not as close. So I need to either draw while using my binoculars or a scope, or take photos. I opted for some photos. As with many parts of nature the more you look the more beautiful you find it. The same is true of House Sparrows. I don't like them because they've driven off almost all of our other feeder birds. They constitute 90% of our feeder birds each winter any more. But they do have their own beauty and personality. I've been using my various Stillman & Birn sketchbooks mainly to draw in ink recently. 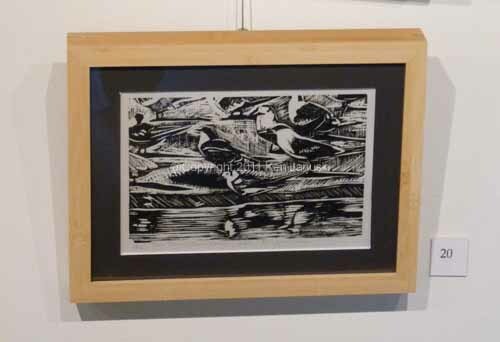 That was the case with the Canada Geese in the last post. The sketchbooks have worked well for that and for all of my work. In this case though I wanted to use a fine pencil as a guide for a watercolor, one in which the orginal pencil lines probably wouldn't be evident at the end. This work is done on a 6x8 inch Beta series sketchbook. As I flip through the sketchbook I notice that the Lincoln's Sparrow of a week or so ago was also done in the same method in the Beta. It has worked well for this method as well as for the runny ink and watercolor method that I often used. I used to use another brand of sketchbook for this type of work. It also worked well enough but I was always hesitant to sell any of the works that I liked. The paper didn't seem of high enough quality. I compensated by lowering the price for those works. But with a stronger paper like this I'm not hesitant. The paper works fine for more finished work. But the purpose of these is still as small, experimental sketches. It's an easy and quick way to try something out and see if it might deserve fuller working in paint or printing ink. I'm still not sure where this one might lead but I am quite tempted to do a more permanent homage to these bullies of the bird feeder. With just a bit of daylight left after gallery sitting at the Manayunk Roxborough Art Center I decided to try the quick Bic pen and watercolor sketch above. I continue to like this manner of working. This is based on a photo I took a week or two at Morris Arboretum. I knew that I wasn't going to get much detail on the two geese. But I was really more interested in the entire scene: bright fallen leaves of autumn, huge fallen beech, and two Canada Geese on a sand bar in water that reflected all the colors around it. A sketch like this is just another way of exploring that scene and determining whether or not it deserves further exploration in paint or print. 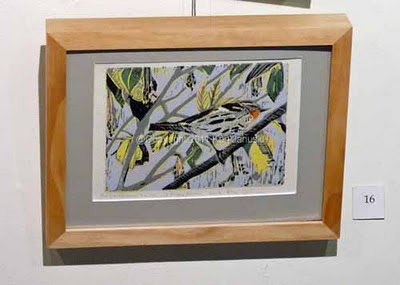 The MRAC Holiday Show in Philadelphia continues on Saturday and Sunday from 10 a.m. until 4 p.m. tomorrow, the following weekend and in January. Above are two of my framed prints that hang in it. These prints as well as prints in mats are available for sale there, as are the works of all the other MRAC artists who are exhibiting. It is located in the rear of 419 Green Lane in Manayunk/Roxborough. I had one more thing to finish up before starting something new like the quick watercolor at top. This is the finished version of the small 4x6 osprey linocut. I finally finished adding watercolor to the edition of nine prints. This photo is a bit dark. The actual print is a bit brighter than this. There is much more that can be done with this method of working, as I mentioned in another post. But this served as a good introduction to me. It's very odd coloring in each of the prints, almost like going back to grade school. On the other hand some artists do incredibly sophisticated work with this method. I'm sure I'll try a couple more prints in this method to get a better idea of how it works for me. Yesterday we decided to take a brief break and take advantage of the sun and relatively warm weather. But a two hour walk at Morris Arboretum found few birds until we were getting near to closing time. I thought I saw some movement in some tall grasses. I put my binoculars on it and saw a sparrow like bird with its tail cocked. Soon after it flushed and went to the top of a tall grass. The first thing I noticed was the buffy/ochre malar, one sign of a Lincoln's Sparrow. That got my attention and so I looked very carefully trying to note all the markings. I was so involved with that that I forgot I was carrying my camera. Soon it flew, and then flew again. Another sparrow like bird flew with it. 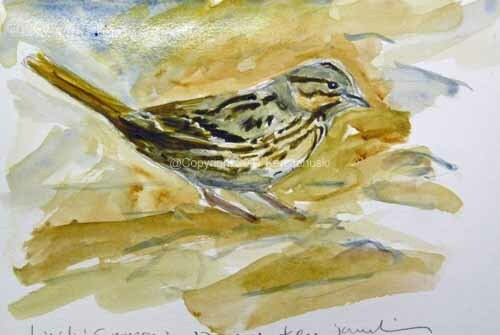 About 15 minutes later we came across two more very secretive sparrows in the grasses. You could see the stems move as they ate but the birds themselves just wouldn't show themselves. For me this is always an interesting time. I'd love to say that at least one of the birds was the beautiful Lincoln's Sparrow. But was there enough evidence? When I got home I looked through 3 or 4 guides trying to come to a conclusion. The buffy malars, fine streaking on breast and gray nape, all of which I carefully noted while looking at bird, indicated possible Lincoln's. But as it flew there was a flash of a light, whitish belly. That seemed more reminiscent of a Savannah Sparrow than a Lincoln's. This is one of the many instances where as a birder you really can't say for sure what you've seen. And if the bird is mainly in memory without any visual representation it may morph into just about anything over time. So today I decided to do some sketches from memory. I knew that they would look bad. I just don't know birds well enough that I can do a good job drawing them from memory. Those sketches are above. In one I wanted to capture the buffy malar. In another I tried to show the fine-streaking and center spot when viewed from the front. Finally a sketch showing the cocked tail. After that I pulled out some photos I'd taken of a Lincoln's Sparrow at Magee Marsh this spring. I then did the watercolor at top based on it. This was a very quick, 30-60 minute sketch. As I did it I compared it to my sketches from memory. Boy I have the position of the malar wrong don't I? But I find that this is a good way to learn. Try to draw what I can recall. Then draw or paint from a detailed photo seeing both what was wrong with the memory sketches but also accentuating some areas, like the buffy malar, because of the strong memory of it. I think the best artists can most likely do recognizable birds from memory. I hope one day that I'll reach that state. But the only way to do it is to keep practicing, knowing all the while that the results along the way maybe almost embarassing. This type of exercise is also helpful to my abilities as a birder. As I compare what I remembered from memory to what a detailed photo of the presumed species i learn more about that species. At the end of the exercise I'm more convinced than ever that it was a Lincoln's Sparrow. But I'll have to go find it again to prove it! One thing I never expected when I joined the local Manayunk Roxborough Art Center early this fall was the constant opportunity to exhibit. This is tempered somewhat by a smallish audience but you never know when that might change. So this Sunday's Holiday Show, with festivities from noon to 3, is one more opportunity to show. I've just finished cutting mats for six prints, building a frame for one paintng, and experimenting with store bought frames for two of the prints. I've always been an artist who's more interested in the art than in the packaging but that's easier to do when your art stays in the studio. 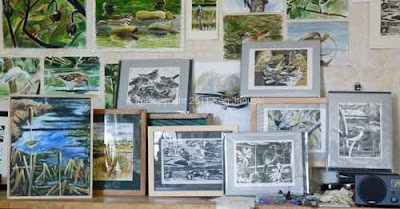 If it's being exhibited somewhere then you need to consider things like mats, frames and of course their cost. I'm surprised that I don't mind this work and the cost hasn't been as bad as I feared. I guess part of that is that the work just looks better in a mat and/or frame. If it doesn't end up on someone else's wall it might just end up on mine, somewhere outside of the studio. The photo above shows the newly matted and framed work in the studio along with some other work on the walls. 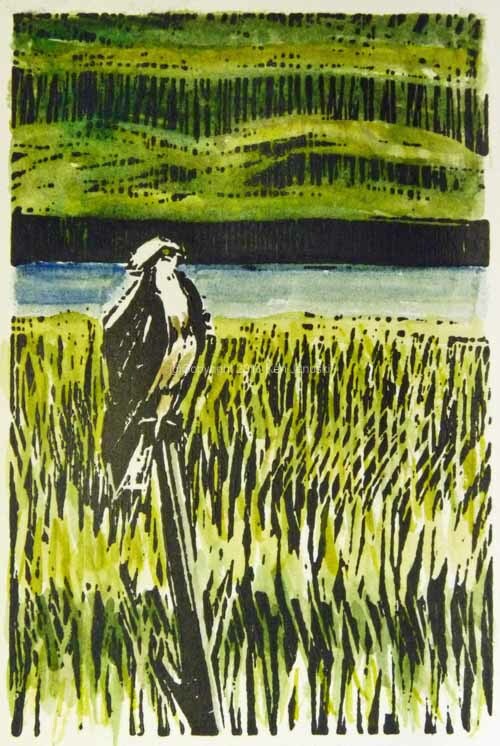 I've only had time to try watercolor on one of the tiny osprey prints. It is below. I'll probably try another version or two on the two remaining proofs then watercolor the remaining prints in similar colors. This is not my most ambitious work but I still find it somewhat striking.